Addebito su carta di credito del 30% del totale. Located in the Capital city of the Island, among Islamic influenced markets and beautiful baroque churches, Federico Secondo Bed & Breakfast provides every comfort to his guests. 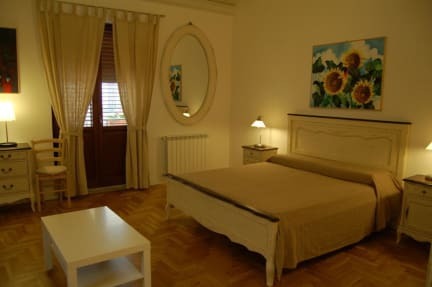 In fact, B&B Federico Secondo is located just in the historic centre of Palermo in the vicinity of the Cathedral, from which it's about only 15 meters, near the Cape Arabic Market and the Royal Palace, and in front of the famous antique flea market. Spending your holidays in this beautiful bed and breakfast, you can walk in the old city streets, where you can taste the magical atmosphere of the ancient popular markets. 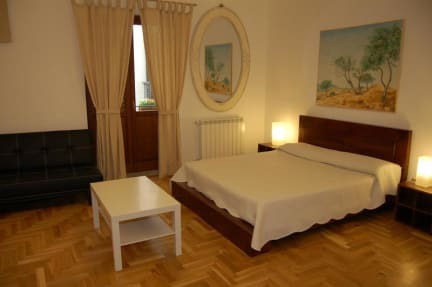 Choosing B&B Federico Secondo is the best way to spend your holidays without city movements problems. Redecorated, built where king Federico II used to play during his childhood. The structure has many rooms where you can spend your holidays in complete relax and fun. B&B Federico Secondo has plainly equipped rooms, provided with every comfort: central heating, air-conditioner, tv color, private bathroom with shower, dryer, bed and bathroom laundry. In the low ground is placed a delightful breakfast room. The structure is perfect for family or friends holiday time. The bed and breakfast is actually placed among many shops, restaurants and nightclubs. The palace also has elevator. The B&B landlords are wine makers, too, so they own the 'Federico Secondo' wine label. Therefore, in the B&B you can taste or buy this great wine, taking you home a piece of Sicily.